If you have an iPhone and spend a great deal of time and money sending text messages, or if you have an iPod Touch and wish you could send text messages on it, you’re in luck. 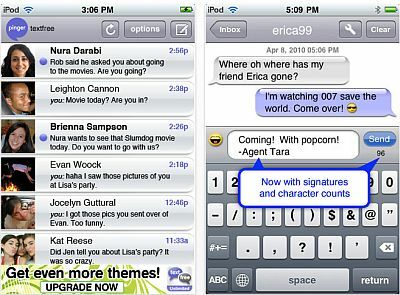 There’s now an app called Textfree and it’s available for both the iPhone and the iPod Touch. The Textfree iPhone app was actually created some time ago by the developers at Pinger, but exciting additions have recently been made to it. The major addition is that Pinger is now going to add a calling feature onto the app. Great for iPhone users who want to be able to have a second line on their phone and at the same time save on high carrier charges, and wonderful for iPod Touch users that want to have a phone line put on their phone. The addition comes with a whole new name too – Textfree iPod Touch App with Voice, and it’s really all in the name. Users of the iPhone will have a second phone line that can be used free of charge by the phone owner. Free of charge! That’s a huge advantage over services such as Voip or even Skype, which plans to start charging Skype-to-Skype users later on this summer. And, best of all, it opens a whole new door for iPod Touch users too. Imagine being able to text from your Touch wherever you are – your iPod Touch just became a whole lot handier than it already was! The full version of Textfree is not a free app, one way that the app’s name is misleading. But, both iPhone and iPod Touch users can download the Lite version for free here.